The Fleur-de-Lis (French for lily flower) has been used as a symbol by royalty for hundreds of years, as well as a political symbol. Most recently, it has become popular as a symbol of recovery, both from the devastation of hurricane Katrina and from the scourge of breast cancer. It was adopted as a Louisiana state symbol in 2008. 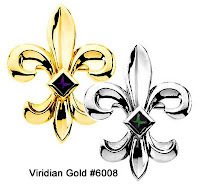 At Viridian Gold, you will find that the Fleur-de-Lis is available in several jewelry styles. For instance, our Gold Fleur-de-Lis Circle Pendants #5307 makes a simple, beautiful statement in either yellow or white 14K gold. 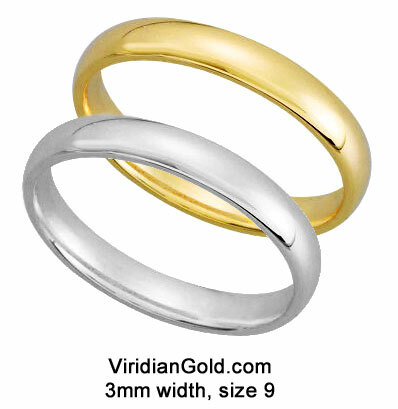 This style is also available in Sterling Silver with gold accents. If you would like your Fleur decorated with a gemstone, you will be interested in our Fleur-de Lis Birthstone Brooches #6008, available in 14K yellow or white gold, as well as economical 10K yellow gold. 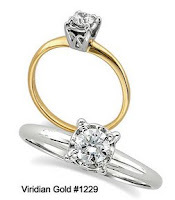 The stone may be selected as a birthstone, or simply as your favorite color to complement your wardrobe. 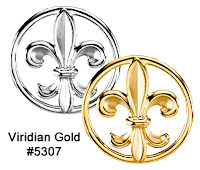 You will find many types of Fleur-de-Lis jewelry on our website: rings, pendants, brooches and more--to see them all, just Search Viridian Gold for Fleur-de-Lis.